that reminded me of this one at avus which was there on youtube too.a legend in the making. vikki wrote: that reminded me of this one at avus which was there on youtube too.a legend in the making. It wasn't so much that he didn't turn in enough at the chicane, he appeared to try to turn right instead of left. 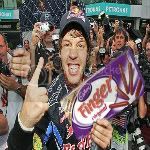 Still, one day he'll be third fastest on the F1 grid. I was always surprised that he made it to f1 as he was often making silly mistakes like this. I think he actually performed better in f1 than he did on his way to f1.